The Category 2 storm — which made landfall in the early hours of March 15 with 175 kph (110 mph) winds and heavy rains — has decimated this southern African country. Driving away from the airport in Beira, a port city that bore the brunt of the cyclone, it was impossible to escape the sight of debris. As the rain eases, residents are emerging to surveying the ruins that remain and begin their clean-up efforts. 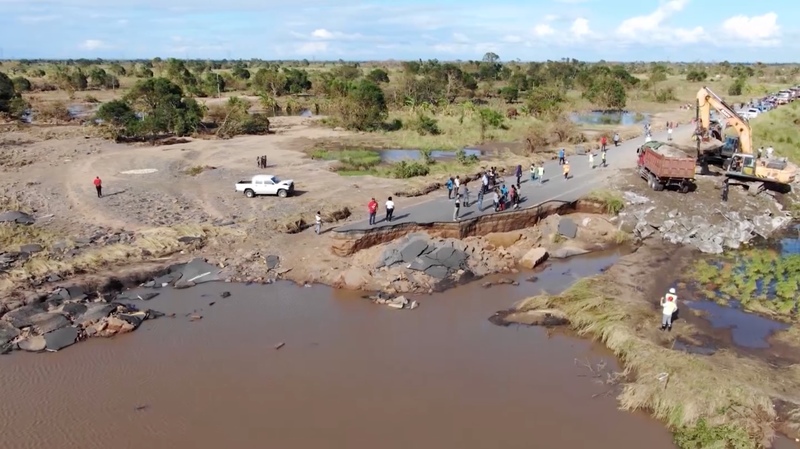 Drone footage shot by CNN between Beira and the village of Tica has revealed the extent of the damage in cyclone-hit areas. Factories have been ripped clean apart while the entire aluminum roof of a school building was hanging precariously, as if someone reached down from the heavens and torn it off. Nothing in Beira — from the cathedral to restaurants, banks and the port, where the cyclone dislodged shipping containers — escaped Idai’s wrath. From affluent homes built in eye-catching Portuguese colonial style to more modest properties, the tropical cyclone took something. Telecom masts, satellite feeds and the internet all bowed to its force. The overall effect was that Idai knocked this thriving port city into a pre-digital world. Yet it’s not until you leave Beira that the cyclone’s destructive powers are really exposed. 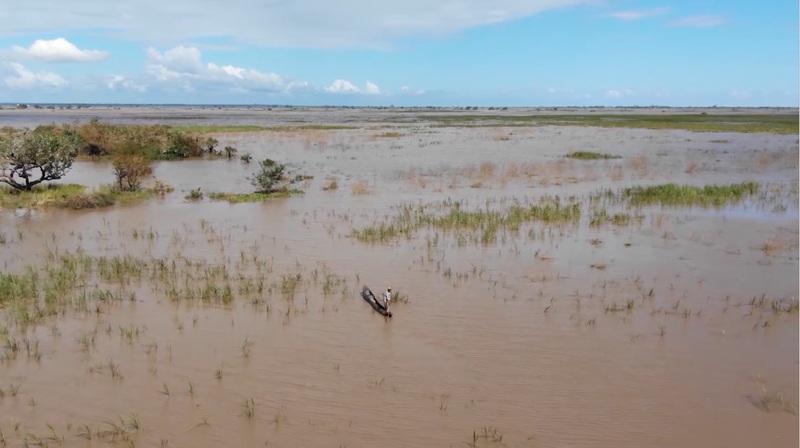 On the road to Tica, around 80 kilometers (49 miles) from Beira’s beaches, drone footage revealed massive tracts of waterlogged land and huge trees snapped like twigs. 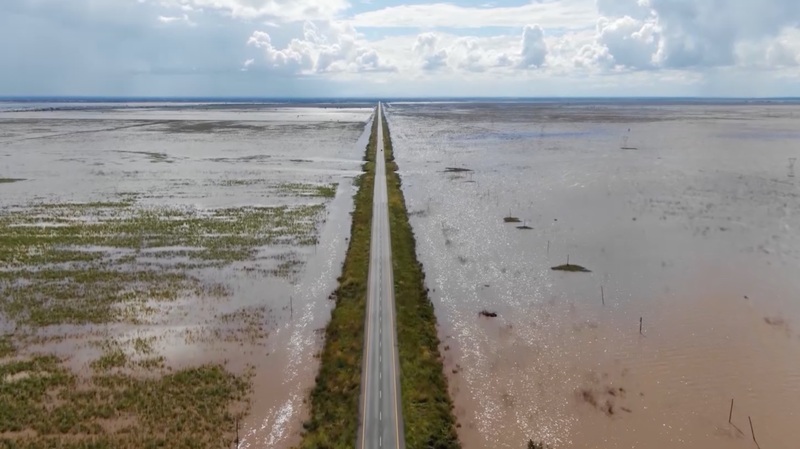 This road into the interior of Mozambique should lead all the way to Zimbabwe with the sea firmly in the rear-view mirror. Instead, the huge swathes of inland water that are visible from space greet motorists. For so many, these waters have taken over their lives. 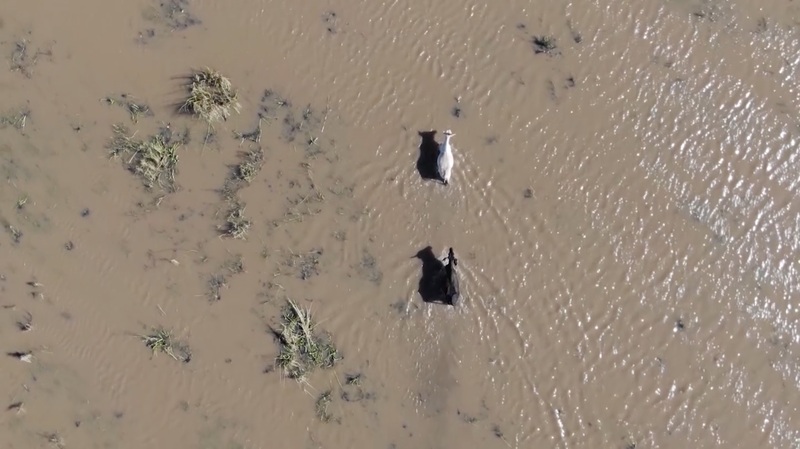 Farmers’ crops have disappeared, and their livestock are left to wade through the murky waters in search of somewhere to graze. Complicating the situation further, the flooding will not clear away anytime soon as rains have continued to fall. The new homeless are left with no choice but to trudge through the waterlogged landscape towards hastily improvised shelters. More than half a million people have been affected in the country and at least 110,000 have sought refuge in camps. Meanwhile, the humanitarian efforts to reach those trapped continue but collapsed roads are hampering progress. 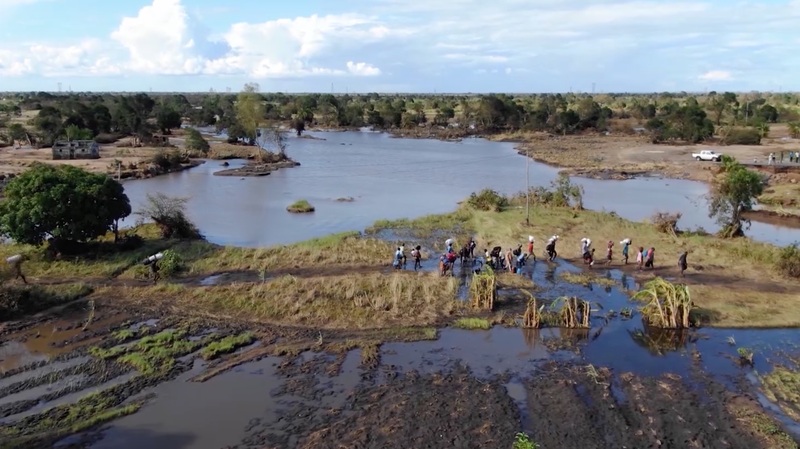 With no other option, some people are using rudimentary canoes to cross the flooded plains while others are trudging across higher ground to safe havens several hours walk away. One eye witness told CNN that in areas where flood waters were still high, people were joining hands to form human chains. Mozambique’s Minister of Land and Environment, Celso Correia, said on Sunday that 446 people have now been reported dead in the country. But aid agencies say it is premature to say how many people have been killed while some affected areas remain inaccessible. Many are wondering at what might come in the next few days in this heady mixture of undiscovered dead, stifling heat and flooded land. Eye witnesses have given ghastly accounts of corpses. One described seeing 300 to 400 bodies wash up on a flooded stretch of road just north of Tica. Mozambican President Philippe Nyesi has called this “a disaster of great proportions,” and its full extent is yet to be truly realized. Farai Sevenzo reported from Mozambique. Lauren Said-Moorhouse contributed to this report.